According to CIVICUS, 'the two primary goals of the CSI are to enhance the strength and sustainability of civil society, and to strengthen civil society’s contribution to positive social change' ('Introduction to the CSI', http://www.civicus.org/csi). 1. Civic Engagement: 'The extent to which individuals engage in social and political initiatives.'2. Level or Organisation: 'The degree of institutionalisation that characterises civil society.'3. Practice of Values: 'The extent to which civil society practices some core values.'4. Perceived Impact: 'The extent to which civil society is able to impact the social and policy arena, according to internal and external perceptions.'5. External Environment: 'The above four dimensions are analysed in the context of "external environment", which includes the socioeconomic, political and cultural variables within which civil society operates (CIVICUS Civil Society Index, 'Armenian Civil Society', Analytical Country Report, 2010. pp. 6.). 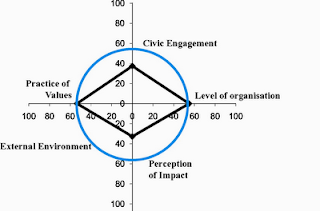 What the diagram shows is that, while Armenia's dimensions of 'Level of Organisation', 'Practice of values' and 'External Environment' demonstrate similar levels of development, the dimensions of 'Civic Engagement' and 'Perception of Impact' are lacking (CIVICUS Civil Society Index, 'Armenian Civil Society, CIVICUS Civil Society Index, 2010. pp. 6.). According to the study, the weak score for 'Civic Engagement' is due to the lack of participation in civil society by the civilian population. Despite this, those who do participate do so 'frequently and extensively'. Also worth noting is that the 'Practice of Values' dimension shows a 'considerable level of internalisation and promotion of values in Armenian civil society'. The 'Perception of Impact' dimension is the lowest score and the 'External Environment' dimension continues to be obstructed by corruption and lack of devotion to the rule of law, according to the report (CIVICUS Civil Society Index, 'Armenian Civil Society', 2010. pp. 7.). While presenting the report, Lusine Hakobyan, lead CSI coordinator for Counterpart International, acknowledged the local and international organisations that joined in evaluating the state and trends of Armenian civil society. Particularly, thanks were addressed to CRRC-Armenia for assisting with the sampling for the public opinion survey throughout Armenia. The event was attended by H.E. Ambassador Marie Yovanovitch of the Embassy of the U.S.A., who gave the keynote address. The report was officially launched by the Head of Office for Security and Cooperation in Europe Office in Yerevan, Ambassador Sergey Kapinos. The study was implemented by Counterpart International with support from USAID, CIVICUS World Alliance for Civic Participation, OCSE office, UNDP, Civic Development and Partnership Foundation, NGO Center/northern branch, Partnership and Teaching NGO, Professionals for Civil Society NGO, the Caucasus Research and Resource Centers, Black Sea Trust for Regional Cooperation and Antares Holding. Further, Counterpart International-Armenia partnered with the Third Sector Foundation of Turkey (TUSEV) to develop another comparative study, which compliments the CIVICUS CSI country analytical reports of Armenia and Turkey. The study was conducted in the framework of the Cross Border Cooperation Initiative supported by The Black Sea Trust for Regional Cooperation, a project of the German Marshall Fund of the United States. - 'Armenian Civil Society' from Transition to Consolidation', CIVICUS Civil Society Index, Analytical Country Report, 2010. - 'Introduction to the CSI', http://www.civicus.org/csi. - 'The Two Diamonds: Comparative Study of the State of Civil in Armenia and Turkey', Counterpart International/Armenia and Third Sector Foundation/Turkey, 2010.